Our breads come in 3 main groups, white, malted and wholemeal. These are available with a number of different toppings e.g. seeds and barley, as well as in various slice sizes or completely uncut. We can also make bespoke breads to your exact specifications. Please contact salesforce@fostersbakery.co.uk for more information on slice thicknesses, case sizes, price enquiries and samples. White bloomer comes in a variety of different slice thicknesses. Comes in cases of 4, 5, 8 and 11. Malted bloomer comes in a variety of different slice thicknesses. Comes in cases of 4, 5, 8 and 11. Also available with a barley topping. Wholemeal bloomer comes in a variety of different slice thicknesses. Comes in cases of 4, 5, 8 and 11. Multi-seed bloomer comes in a variety of different slice thicknesses. Comes in cases of 4 and 8. White box comes in a variety of different slice thicknesses. Comes in cases of 5, 8, 10, 11 and 12. Also available with oats and barley. Malted box comes in a variety of different slice thicknesses. Comes in cases of 5, 8, 10, 11 and 12. Wholemeal box comes in a variety of different slice thicknesses. Comes in cases of 5, 8 and 10. 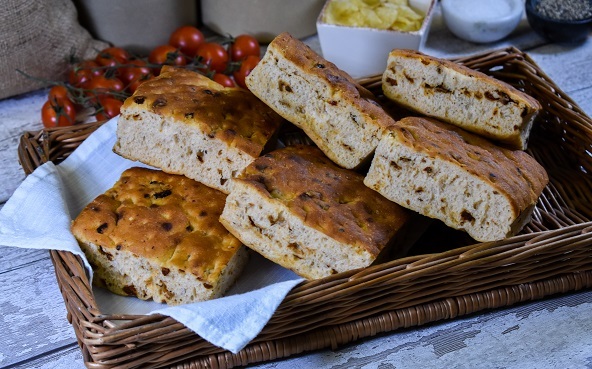 Sundried tomato box loaf comes in 18+2 slice thickness and comes in cases of 5. Onion box loaf comes in 18+2 slice thickness and comes in cases of 5. Malted split tin comes uncut and in 14+2 and 16+2 slice thicknesses and comes in cases of 5 and 8. White split tin comes uncut and in 14+2 and 16+2 slice thicknesses. Comes in cases of 5 and 8. Toastie loaf comes in cases of 12 and is available sliced or un-sliced. Mini box loaves and mini bloomer loaves are available in various flavours. Comes in different variations such as bloomer, box and campaillou style. We also bake part-sourdough loaves.